7 weeks done in Project 365! I started this project a few years ago now. 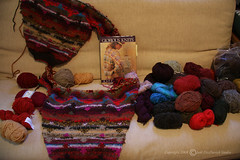 I had put it away for a long time as I am not happy with how one of the chenille yarns is behaving - already worming! But I've decided I need to finish this UFO (UnFinished Object). To that end, I've put the pieces and yarns out on the futon in the guest room where I will see it everytime I walk by the door. So I am now considering it a WIP - Work In Progress. For those that are familiar with Kaffe Fassett's Jack's Back Stripe in his Glorious Knits book, you will see I have done something different here than what the pattern called for. In the book, Kaffe directs you to start at one cuff and finish at the other, all in one piece for sleeves and body. Since the original yarns were no longer available, I had to go for similar colors in yarns of my own choosing. SInce I figured I'd either forget which ones I had used, or run out before I got there, and the colors are supposed to be symetrical, I am knitting from each cuff towards the middle and will then graft the two pieces together. I had to do some charting (using Excel as my "graph paper") to make sure the points in the design were facing the proper way on each piece - hope I got it right, but if not it will still be beautiful, if I do say so myself. I'll address the worming later, it's too far back to frog stitch. May have to keep a crochet hook always in the pocket for fixing on the fly! I'll post again when I've made more progress. I'll be anxious to see this progress!